Thank you! It gave me all the clues I needed to open my old Singer case again. Okay, and thank SO much for this information. I’m adding a 3mm screw driver to my keychain. Thank you so much! I now have my beautiful 1939 Vintage Singer Sewing Machine open with no damage to the case. I got my beautiful vintage machine unlocked and thanks to you tube found a video on how to wind the bobbin….she is threaded and full bobbin and raring to go.I am so excited! i lost the key to my antique singer in a move.Thank you soooo much! Seriously fantastic! Thanks so much it took me less than a minute to get the lid off of my Singer model 15•91. Douglas, seeing as how your locksmith took yours apart, I would be surprised if he doesn’t know how those locks are put together. But whatever, if I was you I’d just bide my time and find a cheap bentwood case with a working lock of the same type (which it will be if it’s for the same model and the fittings on the other end of the case are the same). I had problems unlocking one of my Singers – it’s my favorite – so I took it to the local locksmith. The key would turn the right way, but maybe only 85 of the 90degrees required to unlock the case. The locksmith was able to get it open and when he unscrewed the lock from the case, we discovered that a flat metal spring was broken. – can the spring be replaced? 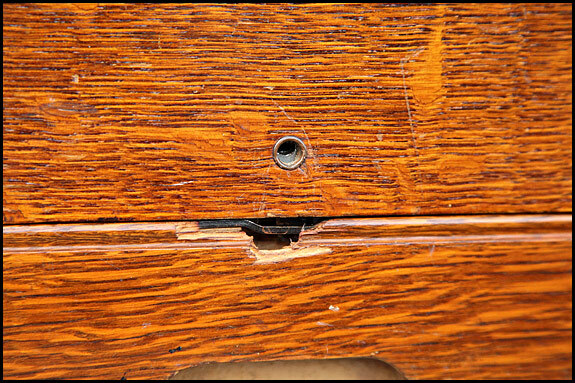 – keep my eyes open for a damaged bentwood case, and take the lock from it? For now, I’m just setting the case over the machine to keep dust out, but it would be nice to replace or repair the lock. 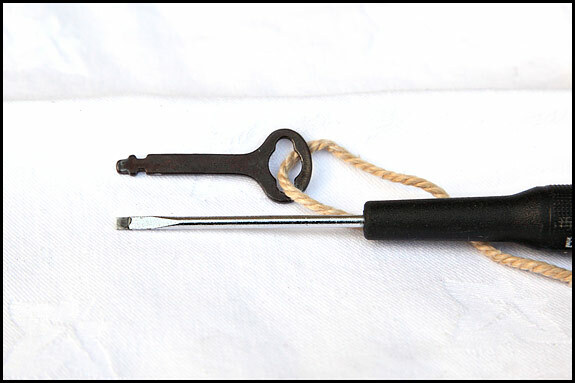 I’ve also thought about unscrewing one of the locks from one of my other Singers bentwood cases, and taking it in the locksmith so he can see how it’s put together… Maybe that will give him some ideas, too. 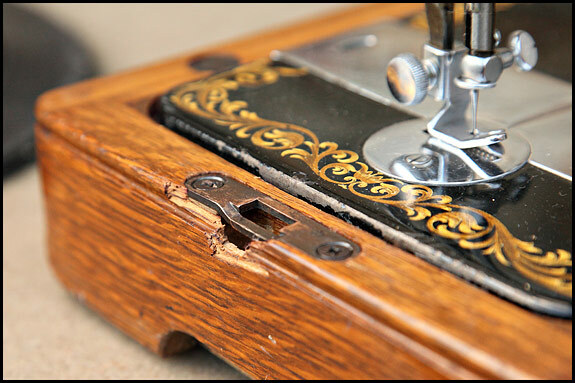 The screwdriver hint worked on the bentwood case for my 1913 Singer handcrank machine. Is there anywhere I can locate a key for the case? Right now I have the screwdriver tied to the case so I can take it with me and be able to lock/unlock it. But a key would be easier to travel with. Thanks for any advice. 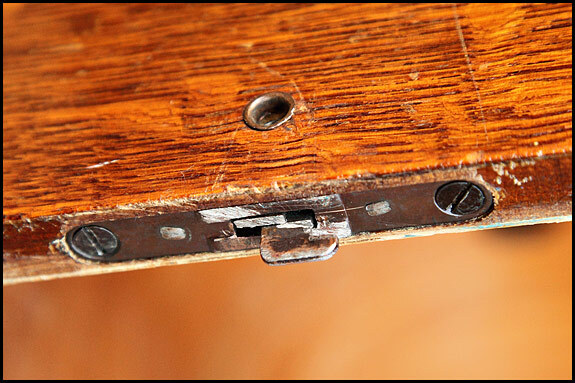 I have a 1910 Treadle machine that I am restoring at the moment and would like to add that the locks on the hanging drawers are anticlockwise to lock and clockwise to unlock. The other locks on the machine, table top and drawer, are clockwise to lock and anticlockwise to unlock. And the screwdriver workaround is certainly easier than trying to purchase the correct key over the web! Thank you very much for your instructions! It took me not more than 10 min to unlock my wooden case. 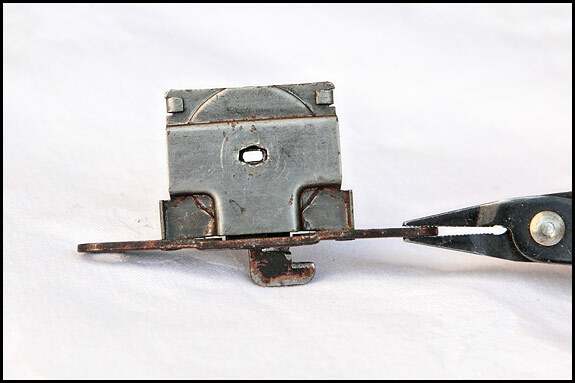 SInce I wrote last, I have managed to find the original key to the Singer I mentioned in my earlier comments. I have a question regarding it, however. I put the key in, and turn it, to unlock the case. However, the key won’t then release itself from the lock, when it’s in the “unlocked” position. When I turn the key back to the “locked” position, it slides out comfortably. Why is this? Is it a specific part of the lock-design, to prevent missing keys? I was curious about this. I got some general-purpose lubricating oil and squirted a decent dose of it down the keyhole. A few minutes of waiting, another jiggle with the screwdriver and a bit of extra pressure and it’s open! This screwdriver trick of yours really is a wonder. when I saw the keyhole, I had no idea how the hell I’d open it, but you found the way. Thanks very much for this tip! Works an absolute treat! 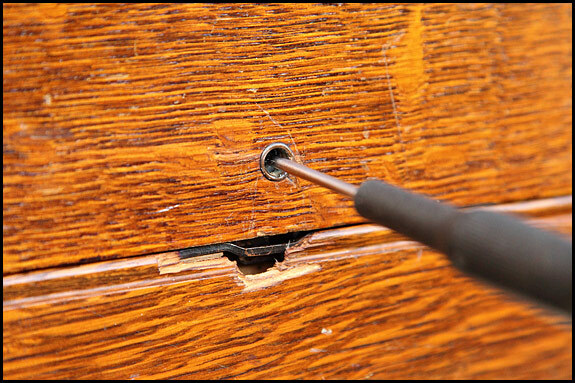 The screwdriver ‘key’ turns clockwise to unlock, anticlockwise to lock. Everything’s there. Including the curved knee-bar! I thought gran had lost that years ago. I have recently dug my grandmother’s vintage SINGER sewing machine out of the depths of the household catacombs. I’m about 75% sure it’s a 1930s Model 99. But I have a problem. It’s locked inside its bentwood case. I’m fortunate in that I DO have a 3mm flathead screwdriver, but while it fits into the keyhole, it won’t TURN! What lubricant should I use to unlock the case? I’m currently turning CLOCKWISE. I have WD-40 and I also have graphite-powder. Which one would work best? Your directions worked like a champ and saved our case! I cannot thank you enough for the article and photos! I originally thought the large hole in the front of the case must give access to a crank mechanism to withdraw cams or something, so I even was looking at the wrong hole in the case. Your post is much appreciated. Thank you so much for this information. I cannot believe I found such detailed information online! It worked exactly as you stated and saved me the time and money required to take the machine to a locksmith! You Have no Idea how much this helped! thanks a million.